On April 4, the American Foundation for the Blind presented me with the Helen Keller Achievement Award! Helen Keller has had a huge influence on my life — her books, her advocacy, and especially her incredible spirit. Receiving this award is a tremendous honor. I’m determined to devote my life to advocacy, just like Helen. During her life Helen served as an ambassador for the American Foundation for the Blind. AFB created this award to recognize individuals and organizations that represent the spirit of Helen Keller. Past awardees include Stevie Wonder, Ray Charles, Apple, Netflix, and many others. 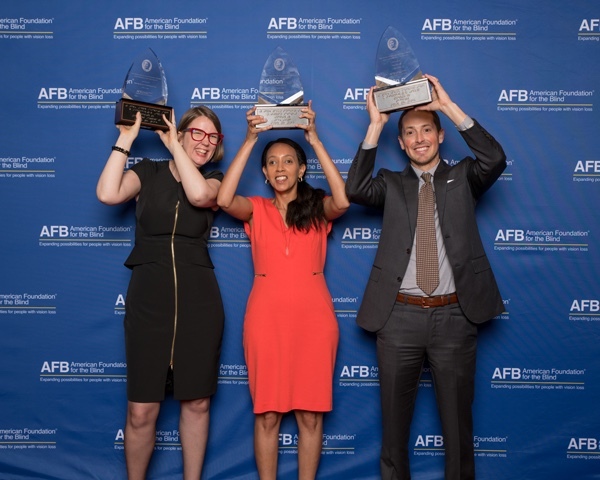 This year AFB also celebrated Microsoft, represented by Chief Accessibility Officer Jenny Lay-Flurrie, and Facebook, represented by Director of Accessibility Jeff Wieland.